Artists, let your imagination run wild with subjects and enter up to three works. The only limitation is size, which is 10-inches square, no larger, no smaller. That’s why the title of this show, organized by AmadorArts Gallery in Sutter Creek, is called “10.10.4.50 For the Arts.” There’s one more thing…each work will have a price tag of $50. Artists who live anywhere in California are invited to enter.The deadline to give your intent is May 15, 2017, for the exhibit which will run from June 3 to 26 in the AmadorArts Gallery. This is an arts fundraiser which means for each sale, $25 will go to the artist, and $25 will fund AmadorArts community programs such as Arts in Education and free summer concerts. Return of any unsold art on June 28 is the responsibility of the artist, or perhaps it may be donated to the non-profit agency for future fundraising efforts. 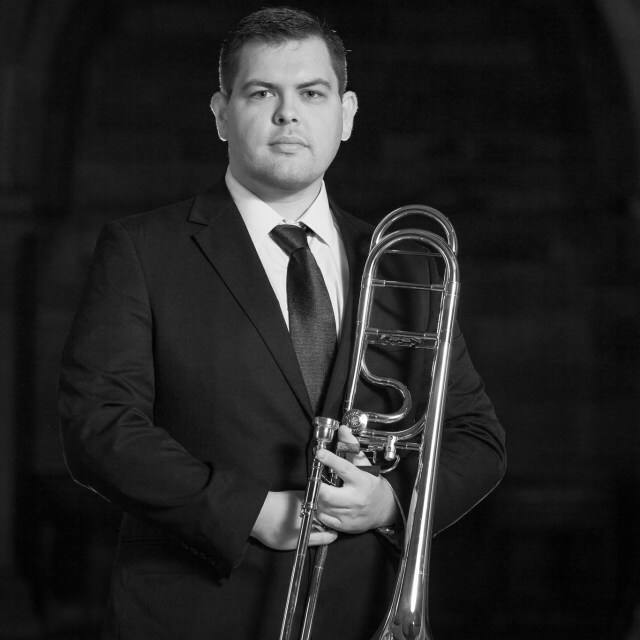 Bass trombonist Rudi Hoehn is the principal bass trombonist of the Hawaii Symphony and the Santa Barbara Symphony. Rudi received his M.M. degree from The Juilliard School in 2012, where he studied on scholarship with James Markey, then of the New York Philharmonic. Rudi has previously held positions with the Charlotte Symphony Orchestra and the Kalamazoo Symphony Orchestra, and has performed with numerous other organizations including the Seattle Symphony, Sarasota Orchestra, and the Sacramento Philharmonic. He has recorded professionally with contemporary music ensemble NOVUS NY, has been featured on NPR’s Performance Today, and was also one of three finalists in the 2012 International Trombone Festival Donald Yaxley Solo Competition. Rudi earned his B.M. degree in 2009 from California State University Sacramento, where he studied with Joel Elias. 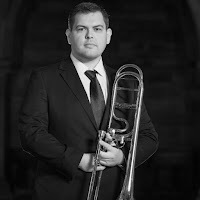 During 2006-2007, Rudi was awarded Rotary International's Ambassadorial Scholarship, whereupon he lived in Germany and studied at the Musikhochschule Trossingen with Abbie Conant, retired principal trombone of the Munich Philharmonic. 3 Performances Only ~ A collection of short plays, scenes and monologues in under 90 minutes! 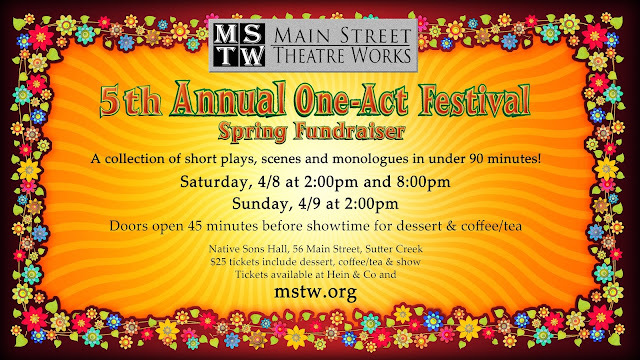 JACKSON, CA – Honoring “short attention spans” everywhere, Main Street Theatre Works presents their Fifth Annual One-Act Festival. This two-day-only fundraising event is April 8 and 9 at the Native Sons Hall in Sutter Creek. Due to popular demand of the matinee performances, there will be two matinees ~ Saturday, April 8 and Sunday, April 9, ~ doors open at 1:15 pm for dessert, show starts at 2 pm. There is also an evening performance on Saturday, April 8 ~. doors open at 7:15 pm for dessert, and the show starts at 8:00 pm. Tickets are $25 each and include dessert, your choice of coffee or tea, and the show, plus there will be a no-host wine bar featuring Amador’s own Bella Grace Wine. Also, as part of the fundraising efforts, MSTW will be holding a raffle, giving away lodging in scenic Lake Tahoe ~ A beautiful condo at the Lake Tahoe Vacation Resort, on the lake at the corner of Ski Run Blvd and Hwy 50. The condo has one bedroom and a full kitchen, and access to a variety of amenities including a pool, Jacuzzi, sauna, full bar, restaurant and more. Accommodations are for two nights, Sunday through Thursday. Raffle tickets will be sold at the One-Act Festival, or can be purchased from a MSTW board member. Raffle ticket holders need not be present to win. This year’s One Act-Festival features many of your favorite MSTW actors ~ Cynthia Drumbor, Thomas Dean, Lisa Derthick, Kelley Ogden, Janey Pintar, Allen Pontes, Brandon Rapoza, Linda Taylor, Scott Taylor, Georgann Wallace, and Kendrick Wells, plus others new to the company like Mallory Broduer, Jacob Garcia, Justin Goodwin, Devon La Bar, & introducing Kali Wells. In less than 90 minutes you’ll see these talented actors perform a variety of different one-act plays, scenes from popular plays and monologs. And this year, MSTW is honored to present four one-act plays written by Sacramento playwrights Thomas Dean, Gloria B. Jones, Margaret Morneau, and Leo McElroy. 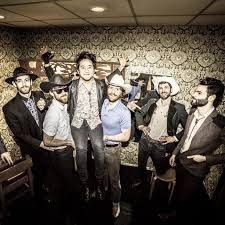 This fundraiser helps to set the stage for MSTW’s upcoming Summer Season at the beautiful Kennedy Mine Amphitheatre, located in the heart of Jackson. Kicking off the season is the hilarious and fast-paced comedy, Doublewide, Texas. The inhabitants of one of the smallest trailer parks in Texas—four doublewides and a shed—are thrown for a loop when they realize the nearby town of Tugaloo is determined to annex them. Mayhem escalates as the residents attempt to secede from Texas, discover a traitor in their midst, and then turn the tables in a surprising and side-splitting finale. The show runs June 23 – July 22. Our second show is The Crucible, Arthur Miller’s explosive look at the famous Salem witch trials. It has the intensity of a thriller, but is also a cautionary tale of extremism that can lead to dangerous mass hysteria. The Crucible runs August 11 through September 9. While MSTW looks forward to another spectacular Summer Season, we can’t do it without a successful Spring Fundraiser, so put the dates on your calendar. Seating for this event is very limited so purchase your tickets today. 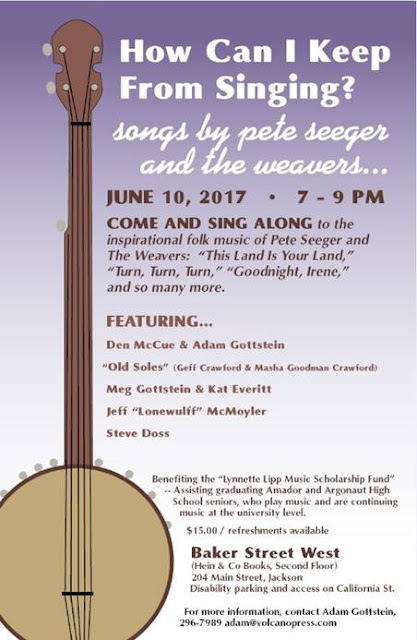 The price of admission includes not only the show, but some fabulous desserts, tea/coffee, and the joy of knowing you’re supporting one of Amador County’s best professional-quality theatre companies. Main Street Theatre Works would like to thank our sponsors Sue Hepworth of Coldwell Banker Sutter Creek Assoicates, and Bella Grace Vineyards. For more information and to purchase tickets to this Limited Engagement Event, visit the MSTW website at www.mstw.org. This event is guaranteed to sell out, so get your tickets today! Announcing new “LOCALS LIVE” -- a fresh series to complement our lineup of great national, international, and regional entertainment featured at the Sutter Creek Theatre. LOCALS LIVE will showcase premier local bands monthly, emceed by RTV favorites Kam Merzlak and Chuck Boro. Also stay tuned for open mic nights and more! 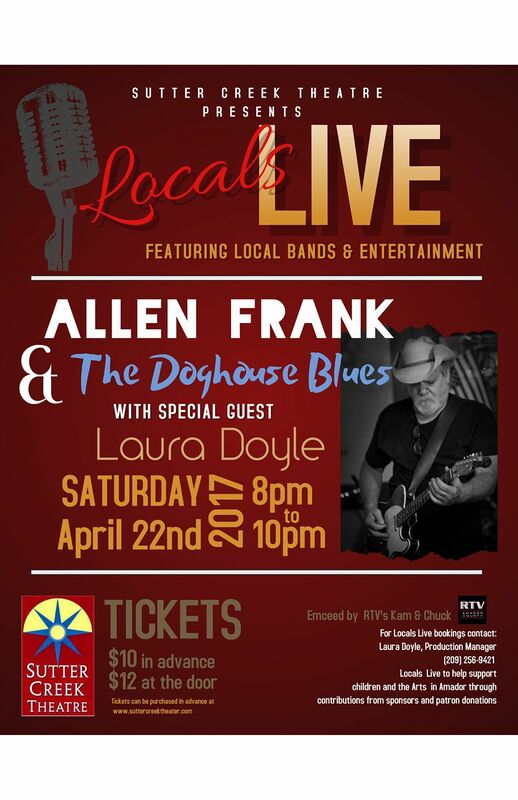 Also pleased to add LAURA DOYLE to our Locals Live production team! LOCALS LIVE supports children in the arts in Amador through contributions from sponsors and patron donation. The Mother Lode Friends of Music, the regional organization of classical music performances, presents a concert of music by American composers on Sunday, March 12, at the Sutter Creek Theatre, 44 Main Street, in Sutter Creek, starting at 3 pm. The centerpiece of the program will be the Appalachian Spring by Aaron Copland in the original version for 13 players, created to accompany the ballet by Martha Graham. The work from its inception has become a timeless classic, winning a Pulitzer Prize in 1944. No other work more perfectly captures the vast open spaces, haunting plainness and the bracing pioneer spirit of America. Also on the program are two other works by Copland: Quiet City for English horn, trumpet and strings, written originally to accompany a play by Irwin Shaw, and Hoe Down, from the ballet Rodeo, in an original collaboration with choreographer Agnes de Mille. The program opens with the well-known Adagio for Strings of Samuel Barber, in a performance dedicated to the memory of Henrik Jul Hansen, longtime conductor of the Friends of Music Orchestra, who died of cancer last fall. Other selections are the Suite for strings of American Romantic composer Arthur Foote and the Second Movement of the Piano Trio for violin, cello and piano of Charles Ives, an innovative American composer of the 19th to 20th centuries who presented snippets of American folk tunes and hymns in a polytonal modernist style that was well ahead of its time. Conducting the Chamber Orchestra of the Friends of Music is Ryan Murray (see photo above) making his local debut. 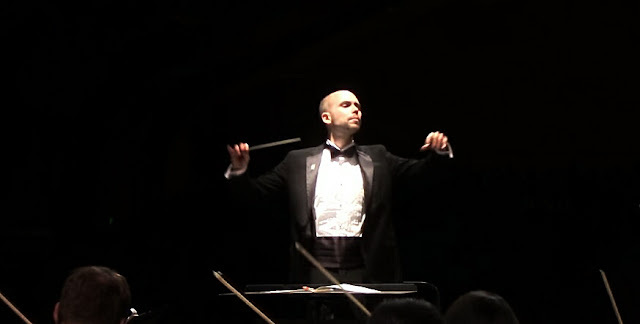 He is currently Artistic Director of the Fresno Grand Opera and the Townsend Opera in Modesto, Associate Conductor of the Modesto Symphony, and Conductor of the Modesto Symphony Youth Orchestra. Performing the English horn solo is Candis Hanson, principal oboe with the Solano Symphony in Fairfield. 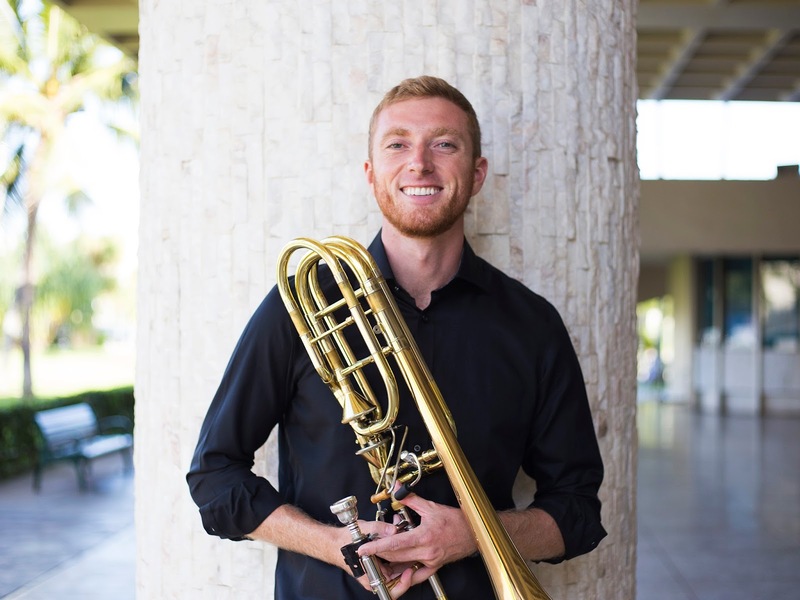 The trumpet solo will be performed by Jeff Chambers, principal trumpet of the South Valley Symphony in Gilroy. 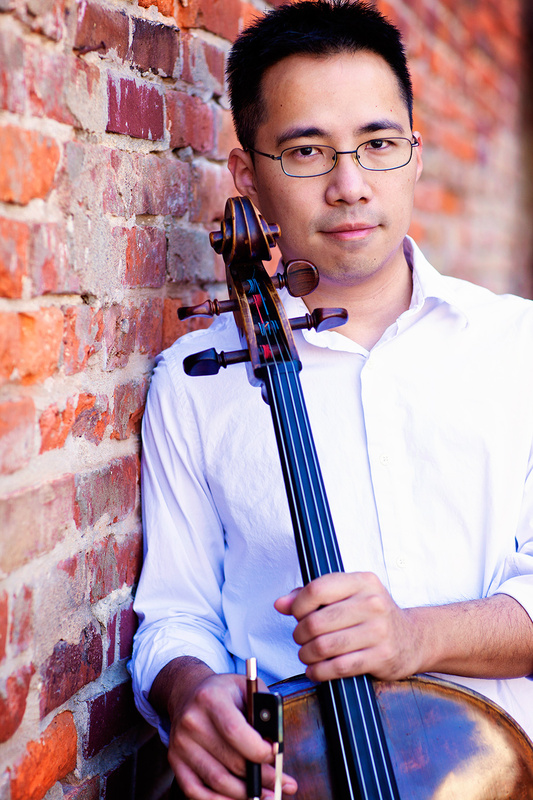 Performing the Ives trio are violinist Corina Stoian, cellist Jia-mo Chen and pianist Ron Brickman. Tickets to the concert are $25 for adults and $10 for children under 18. They may be ordered by mail by sending a check to MLFM, PO Box 1362, Jackson, CA 95642 or purchased at Mother Lode Music in Martell, or at the door. They'll have pizza for sale starting at 5pm! LIVE MUSIC and amazing beers!